The Ganges-Brahmaputra Delta is a river delta in the South Asia region of Bangladesh and in West Bengal, India. It is the world's largest delta. The delta is also known as the Brahmaputra Delta, the Sunderbans Delta, or the Bengal Delta. Because it is also one of the most fertile regions in the world, it is called The Green Delta. The Ganges Delta empties into the Bay of Bengal. It is approximately 354 km (220 mi) across at the Bay of Bengal.. The floodplain is from three rivers: Ganges, the Brahmaputra River and the Meghna River. The delta stretches from the Hooghly River on the west to the Meghna River on the east. In India Kolkata and Haldia are the main seaports. In Bangladesh the main seaports are the Port of Mongla and Chittagong. ↑ 1.0 1.1 "Ganges–Brahmaputra Delta". Delta Alliance. Retrieved 2 December 2016. ↑ 2.0 2.1 Merriam-Webster 1997, p. 412. ↑ Chowdhury, Sifatul Quader; Hassan, M Qumrul (2012). "Bengal Delta". In Islam, Sirajul; Jamal, Ahmed A. (eds.). Banglapedia: National Encyclopedia of Bangladesh (Second ed.). Asiatic Society of Bangladesh. 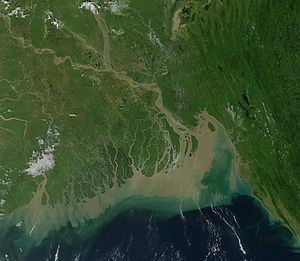 Wikimedia Commons has media related to Ganges Delta. This page was last changed on 21 February 2018, at 08:45.